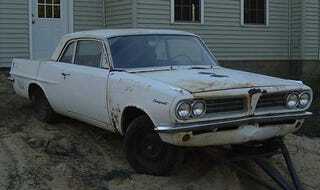 Nice Price Or Crack Pipe: $226,521.63 For A Basket-Case 1963 Pontiac Tempest? By now, almost all of you have heard about the Barn Find Of The Year, the '63 Pontiac Tempest that turned out to be the long-lost Stan Antlocer Factory Experimental drag racer, one of six lightweight '63 coupes stuffed full of 421 goodness by Pontiac back in the day (you can read more about these machines at Hemmings). The seller apparently had no idea what he had until crazy offers to end the auction early started pouring in, thus assuring those with hoarding disorders that you should always save everything… forever! Anyway, heartwarming story, piece of drag racing history, et freakin' cetera, but what we want to know is: how about that price? Did the bidders get carried away in a frenzy of one-upmanship, or is this completely trashed ex-race-car- which we freely admit registers an off-the-scale reading on the Jalopnik Cool-O-Meter™- really worth that much? [eBay Motors], and thanks to many, many of you for the tips on this one. Is 226 grand a pretty good price for the Stan Antlocer Tempest?